A major engineering firm has been sentenced for safety failings following the death of an electrician who was crushed by an overhead crane at a Preston factory. Liam O’Neill had been trying to replace a control cable when the incident happened at Assystem UK Ltd. in Bamber Bridge on 12 March 2011. The 51-year-old, from Didsbury, Greater Manchester, died in hospital seven days later. 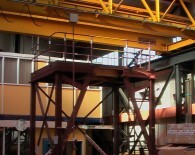 On 26 November, the company, which is part of the international Assystem group, was prosecuted by the Health and Safety Executive (HSE) after an investigation found Mr O’Neill had been able to work on a platform in the path of the overhead crane without the power to the crane first being switched off. Preston Crown Court heard that the platform, which was around four metres above the ground, had been installed for a specific project in September 2000. End stops had previously been fitted to the rails used by the overhead crane that stopped the crane reaching the platform, but these had later been removed. The platform had remained at the factory but there was no barrier at the bottom of the access ladder to prevent workers climbing up it while the crane was in use. On the day of the incident, Mr O’Neill had been trying to replace a cable, which hangs down from the crane to a handheld control, after it had developed an intermittent fault. The crane had been moved over the platform so Mr O’Neill could reach the top of the cable where it connects to a junction box on the crane. As he climbed onto the platform, the crane moved and he was crushed between the guard rails around the top of the ladder and the crane itself. The HSE investigation found the crane cleared the top of the guard rails around the ladder and platform by just 8.5cm. Despite this, the company had not identified the risk of workers being crushed by the crane if they used the platform so no action had been taken to stop this from happening. Assystem UK Ltd., of Club Street in Bamber Bridge, was fined £160,000 and ordered to pay £52,500 in prosecution costs after pleading guilty to a breach of the Health and Safety at Work etc. Act 1974.